I was away on a residential course this past week from Monday to Friday, with no erg access. I ran on Monday and Thursday evenings, but the course was pretty intensive so it was probably a good thing to have enforced erg rest for the week. Straight back on the erg on Friday when I got home. A good solid second rep, pushing reasonably hard throughout. Meant to be a more steady session on Saturday, but I was feeling good so went with it. 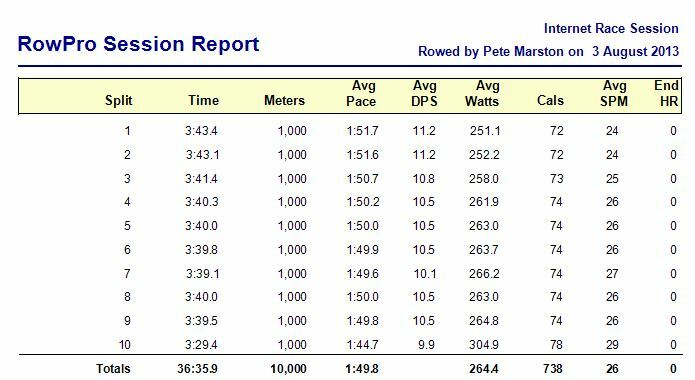 Almost the same average pace as the 2 x 15mins the day before, and it’s good that sub 1:50 pace is now routine for this middle distance “steady” rows. Onto today, and an interesting reps session of 6 x 4mins / 3min rest. 24mins of total time for the session, so I wanted a bit of a tester at faster pace. As I still have a target (still a far off target at the moment….) of getting a sub 35mins for 10k again this year I thought this was a good one to test out 1:45s on. I deliberately kept the rate fairly high, and especially as the pace was brought faster through the session. Overall a good solid few days of training, and really feel like I’m finding some form again without doing any really tough intervals. An interesting session tactically for the CTC this month. It is a fairly standard 8 x 500m / 2min rest session, but with the rules that 4 of the reps must be at 20spm or below, and 4 at 30spm or above. The tactics comes in with which reps to do at 20spm, and which to do at 30spm+, and how hard to push each rep through the session. I decided that the easiest way seemed to be to alternate between low and high rate rep to rep. Pretty happy with that, and quicker than I expected to go pre session. Obviously a fair bit more to give judging by the final rep. Interesting news from Concept2 UK this week. It seems that the company we know of in the UK who sell C2 ergs and run competitions (occasionally…) have become a new organisation called “the rowing company”, at the same location in Nottingham, and Concept2 UK have become a subsidiary of C2 US at a different location. Quite how this will work in practice sales wise I don’t know, it sounds like a risky move to me. But it seems that “the rowing company” (http://therowingcompany.com/) will run the competitions, and there will be a British Indoor Rowing Championships again this year. Only it will be held in Cardiff on the same day as the Welsh IRC, so really it is just BIRC by name, unless it moves to some big new venue. Time will tell, but it is something to train for. 7th December 2013.